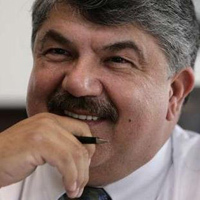 Editor’s note: The following are two statements from AFL-CIO President Richard Trumka: the first was issued May 22, recognizing Senate Judiciary Committee 13-5 vote to send the immigration reform bill to the floor. The second, issued May 21, explains the labor federation’s opposition to the amendments from Republican Senator Orin Hatch on skilled worker H1-B visas. More than 11 million aspiring Americans took a big step toward becoming citizens today with the bipartisan Senate Judiciary Committee vote. That reflects an enormous step toward healing an injustice, the deportation crisis that has wrecked families, communities, and workplaces for far too long. The next step, of course, is not to rest on this accomplishment, but rather to redouble labor’s campaign for a roadmap to citizenship. That will mean everything from old school lobbying to new school social media in conjunction with new and longstanding allies. We appreciate the work done by the Gang of Eight, as well as all those senators – both Democrats and Republicans – who engaged in good faith in the arduous job of advancing this bill. We applaud the progress by the Judiciary Committee, but we will still work to make a good bill even better. We will continue to pursue constructive amendments where needed – whether on family reunification, skilled-worker visas [see statement below], worker protections, or the Uniting American Families Act. But our bottom line remains the same: a reliable, inclusive roadmap to citizenship for sisters and brothers who are American in all but paper. The Senate Judiciary Committee clears that bar readily and we look forward to helping move it to President Obama’s desk expeditiously. 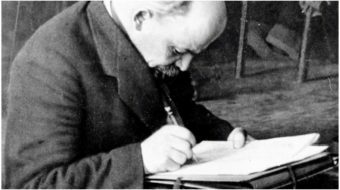 The labor movement has no higher priority in 2013 than a workable immigration system that will allow 11 million aspiring Americans to become citizens. That’s why labor has been working tirelessly with faith groups, DREAMers, and the civil rights community to ensure that we move forward this year and create a roadmap to citizenship. The progress on this bill so far has been commendable. With the hard work of so many for so long, our broad and diverse coalition has become unstoppable. There is no reason why this strong coalition should accept anti-worker amendments. And let’s be clear: Senator Orrin Hatch’s H-1B amendments are unambiguous attacks on American workers. Hatch’s amendments change the bill so that high tech companies could functionally bring in H-1B visa holders without first making the jobs available to American workers. Hatch’s amendments would mean that American corporations could fire American workers in order to bring in H-1B visa holders at lower wages. The next Sergei Brin might be sitting in an American classroom right now. But if that future innovator cannot get an entry-level job in high tech because employers prefer importing temporary workers, entrepreneurial innovations will not occur in the United States. Tech tycoons like Larry Ellison and Mark Zuckerberg have gotten rich while wages in the technology sector have stagnated. Today’s H-1B amendments are being considered on the same day that Apple’s CEO is testifying about Apple’s multi-billion dollar tax avoidance schemes. If the hard work of America’s tech workers is ever to pay off, we need to craft policy that benefits the people who actually write code, rather than just rewarding industry honchos who write checks to politicians. Our goal should be an America in which our young tech workers can pay off their student loans, not one in which Larry Ellison can build ever more extravagant yachts. We expect better, we deserve better, and if necessary, on the floor of the U.S. Senate, we will get better. We are thankful that the Senate Judiciary Committee is likely to report out a bill today that supports a real roadmap to citizenship. We will continue to work with our allies to pass immigration reform with a roadmap to citizenship in 2013. 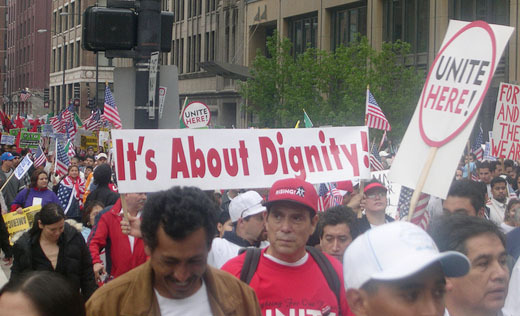 Photo: Unite Here and other labor unions participate in Chicago’s May 1, 2006, mega-immigrant rights march (PW/Pepe Lozano).